In the spring of 1996, His Holiness the Dalai Lama advised the Tibetan people against the practice of propitiating a spirit, known as Dorje Shugden. He said that this practice fosters religious intolerance and leads to the degeneration of Buddhism into a cult of spirit worship. Enraged by this statement, a small number of Shugden devotees in the exile Tibetan community and their vociferous Western supporters, mostly based in Britain, have launched vitriolic disinformation campaigns against His Holiness the Dalai Lama and the Tibetan Government-in-Exile. Beijing quickly saw in this an opportunity to damage the international image of His Holiness the Dalai Lama and, thus, undermine the Tibetan freedom struggle. Throwing the full weight of its propaganda machinery behind the Shugden activists, it painted the exile Tibetan community as a sad society, groaning under the shattering weight of "the Dalai Lama's religious persecution". As a result of this smear campaign from three directions, Dharamsala receives messages voicing concern from wellwishers around the globe. Tibetan Buddhism generally believes in two types of deities and spirits: transcendental beings and worldly beings. Although worldly beings can be positive or negative by nature, transcendental beings belong to the same category as the Buddhas, which means we can take refuge in them, propitiate them and make them offerings. Worldly beings, on the other hand, are like our servants. In return for certain short-term services, we pay them by making ritual offerings to them. We should neither take refuge in them, nor should we worship them to the extent that they become more important than the Buddha. The tradition of propitiating worldly beings as protectors is roughly as old as Tibetan Buddhism itself. It dates back to the ninth century when the Tibetan king, Trisong Detsen, invited Shantarakshita from India to teach Buddhism in Tibet. The local spirits proved hostile to this foreign religion and actively obstructed the efforts of the Indian spiritual master. Shantarakshita then advised the Tibetan king to invite Guru Padmasambhava, a tantric adept from India, to deal with these hostile spirits. Accordingly, Padmasambhava (also known as Guru Rinpoche) came to Tibet and subdued the most powerful spirits. Once vanquished, the spirits were bound by oath to act as Dharma Protectors. Dorje Shugden was unheard of during the time of the historical Buddha. It was not even among those spirits whom Padmasambhava, the founder of the Nyingma school of Tibetan Buddhism, subdued and bound to the oath of protecting the dharma. It was neither among the protector-deities appointed by Marpa Lotsava, Milarepa and Dhagpo Lhaje, the founders of the Kagyud order, nor was Shugden among the deities appointed by the five founders of the Sakya order, nor among those appointed by Tsongkhapa, the founder of the Gelug order. This wrathful spirit arose in conflict with the Fifth Dalai Lama and was hostile towards him. The Fifth Dalai Lama declared that as a result of distorted prayers, a being masquerading as the incarnation of Tulku Dakpa Gyaltsen had arisen as a wrathful spirit that was a source of harm and interference. Rituals were undertaken to oppose him. Since that time the Fifth and Thirteenth Dalai Lamas and several Gaden Throneholders, spiritual heads of the Gelugpa tradition, have placed stringent restrictions on the propitiation of Shugden. The current Sakya Throne Holder, in his letter to the Assembly of Tibetan People's Deputies, wrote: "Today, there is not a single Sakya monastery or centre which follows Shugden practice." He said that his root-gurus - such as the late Khenchen Dorje Chang Ngor Khangsar, the late Khenchen Ngawang Yonten Gyatso and many other realized lamas of the Sakya order - took earnest steps to discourage the Shugden practice and that they drove Shugden from all the Sakya shrines. For Kagyud and Nyingma orders Shugden is anethema. The current Shamar Rinpoche, in his letter to Ladakh Lama Chime Rinpoche's monastery, said: "We Kagyud and Nyingma followers believe that even our bad dreams are caused by Shugden. Propitiation of Shugden goes against the wishes of His Holiness the Dalai Lama and is ultimately harmful to the Tibetan people for two reasons. First, although His Holiness works for harmony amongst his people and encourages a non-sectarian view of religious tradition, Shugden is notoriously sectarian and disruptive of communal harmony. Secondly, such practice leads to the degeneration of the vast and profound teachings of Buddhist tradition. The Buddha's teachings are based on his explanation of the Two Truths and the Four Noble Truths. He advised his followers to take refuge only in the Buddha (the Fully Awakened Being), the Dharma (his doctrine) and the Sangha (the spiritual community). Propitiation of Shugden, as it has recently developed, results in Buddhist practice degenerating into little more than spirit worship. In order to exaggerate Shugden's importance, proponents also sought to portray the spirit as the exclusive protector of the Gelug school of Tibetan Buddhism. This flies in the face of the fact that the protectors recognized by Je Tsongkhapa, the founder of the Gelugpa, as guardians of his tradition are Mahakala, Vaishravana and Kalarupa or Dharmaraja - not Shugden. Despite this, proponents of Shugden have resorted to intimidation and deception to support their case. They warned that swift though the spirit was in bringing material enrichment, he was equally quick to punish so-called apostasy. Great misfortunes, they warned, would be visited upon any practitioner who supplemented or replaced his or her "pure Gelugpa practice" with practices from other traditions of Tibetan Buddhism. Shugden advocates have ascribed the deaths and misfortunes of many lamas and political figures to Shugden's vengeance on just these grounds. Of late, proponents of the Shugden cult have elevated their spirit to such heights that the worship of Shugden is equated with, mixed up or even given more importance than, taking refuge in the Buddha, Dharma and Sangha, the practice which defines a Buddhist. In other words, a worldly spirit is equated or has become more important than the doctrine it is supposed to protect. Owing to the innately disruptive and divisive nature of this practice, which runs counter to the unity of the Tibetan people and the rights of all schools of Tibetan Buddhism and Bon to respect and equal treatment, Tibetan leaders have long discouraged reliance on Shugden. Prominent among them were the Fifth and the Thirteenth Dalai Lamas. Therefore, the Fourteenth Dalai Lama's recent advice to abjure this practice has historical precedence. Not only is he responsible for keeping all Tibetan Buddhist traditions alive when they are threatened with extinction in our homeland, he is also the leader of the Tibetan people at this critical juncture when unity is imperative. Furthermore, as one of the world's foremost Buddhist leaders, His Holiness is concerned that Buddhism in general, with its rich and profound potential for developing the human mind, should not degenerate into mere superstition and spirit worship. Zeme Rinpoche, a highly regarded erudite lama and stalwart practitioner of Shugden, compiled and published a book entitled the Oral Transmission of the Competent Father (pha-rgod bla-ma'i zhal-lung). In it he stated that Shugden would destroy any Gelugpa practitioner, be he an ordinary person, a highly-realized lama or even a ruler, if he supplemented his Gelugpa practice with the practice of other spiritual traditions. Zeme Rinpoche named the following 23 government officials and Buddhist masters who, he said, were put to death by Shugden for practicing the Nyingma tradition: 1) Dordrak Rigzin Pema Trinley, 2) Wolkha Jedrung Lobsang Trinley (also known as Lhelung Sheypai Dorjee), 3) Wolkha Jedrung's reincarnation, who studied at Loseling College of Drepung Monastery and became the abbot of Gyutoed Tantric College, 4) Wolkha Jedrung's second reincarnation, who died while a student at Loseling College, 5) Wolkha Jedrung's third reincarnation, who was born in Tsel Gungthang and died as he was about to be enthroned, 6) Panchen Lobsang Palden Choekyi Dakpa Tenpai Wangchuk, the eighth Panchen Lama, 7) his reincarnation, Panchen Lobsang Thubten Choekyi Nyima Gelek Namgyal, 8) Chamdo Phagbala Lobsang Thubten Mipham Tsultrim Gyaltsen, 9) Thubten Jampel Yeshi Gyaltsen, the Fifth Reting Rinpoche, 10) Kachen Ang Nyima, the tutor of the Nineth Panchen Lama, 11) Khardho Tulku Kelsang Thubten Nyendrak, 12) Nyungney Lama Lobsang Yeshi Gyaltsen, 13) Lobsang Palden Choekyi Wangchuk, the former body of Tehor Sig-gyab Tulku, 14) the former body of Sera Je's Tzenya Tulku, 15) Thubten Kelsang Tenzin, the Sixth Nagchu Drubkhang Tulku, 16) Lobsang Trinley Rabgye, the Dhemo Rinpoche of Tengyeling, 17) Tatsak Jedrung Lobsang Thubten Jigme Gyaltsen Kundeling, 18) Pema Wangchen Surkhang, the Kashag secretary, who died at the age of 22, 19) Shabe Sonam Wangchen, the father of Pema Wangchen Surkhang, who died at the age of 37, 20) Gung Jigme Namgyal Lhalu, 21) his son Phuntsok Rabgye, 22) Tsipon Lungshar, and 23) Kalon Trimon Norbu Wangyal. Zeme Rinpoche's book also stated that in 1954 Shugden used his occult power to bring the biggest flood in Gyangtse, which destroyed many villages and killed thousands of people and animals. Over the past years, Shugden activists have become increasingly virulent in their threats of violence against the critics of the practice. Circulars have been sent to offices of the Tibetan Administration, threatening to unleash acts of terror and death. One letter, dated April 1996, said: "The Dalai Lama and the Tibetan donkey-officials should resolve the problem truthfully, or we will be forced to resort to bloodshed." On 30th April 1996, the Secretary of the Department of Religion and Culture and a representative of the Office of His Holiness the Dalai Lama went to Mundgod to explain His Holiness' advice to the residents of the settlement there. A package was delivered to them containing a knife and the message, "We were unable to meet you this time, but we hope to get you next time." These were no empty threats. On the night of 27 May 1996, an unsuccessful attempt was made in Mundgod, South India, to kill Venerable Thupten Wangyal, a former abbot of the Jangtse College of Gaden Monastery, by setting fire to his house while he was inside it. In January 1997, Geshe Thinley of Jangtse College, Gaden Monastery, was brutally beaten in the Tibetan camp in Delhi. On 9 January 1997, Jangtse College's barn and granary in Mundgod were set afire. It is apparent that these violent incidents were aimed at harming and intimidating critics of the propitiation of Shugden. On 4 February 1997, the Director of the Institute of Buddhist Dialectics, a fearless and outspoken critic of Shugden practice, and two close students were found brutally murdered in the Director's room in Dharamsala. Prolonged and painstaking investigations by the Kangra District Police led them to identify two of the six assailants, both of whom are believed to have escaped to Tibet. Quoting police sources, Jansatta, a Hindi-language daily, reported that during their journey to Dharamsala, the assailants had made a phone call, later traced to Chime Tsering, Secretary of the Shugden Supporters Society in Delhi. Two more assailants, both Shugden activists, were later identified. They too had escaped to Tibet. 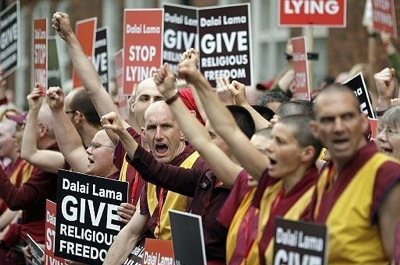 Simultaneously, foreign proponents of Shugden, mostly based in the UK, embarked on a highly aggressive and sophisticated smear campaign against His Holiness the Dalai Lama and his exiled administration. They flooded the Internet, the international media and political circles with allegations of religious persecution and physical threats being made against devotees of Shugden. As a result of this intense lobbying, several reporters and columnists took up the story and conducted their own investigations. The consequent media coverage was largely negative to the Shugden activists themselves, portraying them as members of an intolerant and pretentious cult. The enraged activists then accused the newspersons of bias and distortion. Beijing lost no time in trying to exploit the situation to its advantage. The official Chinese media made much of the criticism of His Holiness and the exile Administration by pro-Shugden groups in India and Europe. 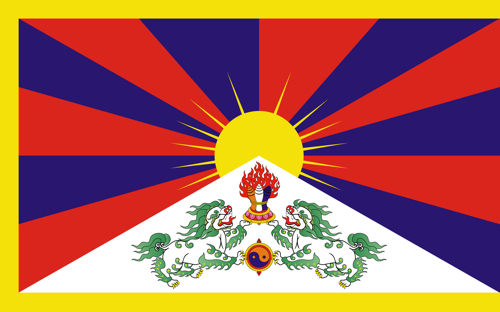 In specific reference to this issue, the official Chinese periodical, China's Tibet, supported the contention of Shugden activists by saying, "Tibetan compatriots living in India and Nepal joined in a collective protest opposing the Dalai Lama's decision and banded together to protect monasteries, lamas and nuns from hounding by the Dalai and his men." From Andrew Brown's article, Battle of the Buddhists..."The more one digs into this story, the more everything comes back to the NKT, a sect founded by Geshe Kelsang Gyatso in the late 1970s after he gained control of the Buddhist centre at Coniston Priory in Cumbria from a rival Buddhist organization...Gods such as Shugden, or Nechung, the traditional protector deity of all Tibet, make their wishes known through trance-oracles, on which all the major decisions of the state are based. In the confused and troubled times of the 1940s, before the Chinese invasion, the cult of Shugden was linked to narrow Gelugpa factionalism, and to a policy that exalted the interests of Central Tibet over the east. In arguing against the cult, and trying to suppress it within his monasteries, the Dalai Lama is not just making a theological point, but a political one: that the Tibetan state he wants would not favour one form of Buddhism over another...But the dispute over Dorje Shugden makes no sense in terms of practical politics in the West. It has already directed a great deal of media attention on the NKT and its elastic ways with truth. Some of the mud being flung at the Dalai Lama will probably stick. The reputation of Tibetan Buddhism as a uniquely clean and rational religion will certainly be damaged. The only lasting winners from the row will be the Chinese, who have mounted a fresh campaign of repression inside Tibet this spring. And Dorje Shugden himself, aching for worshippers inside his lake of boiling blood." The above commentary was excerpted from a 1998 review published by the Tibet Government in Exile. NKT considers virtually everything from the Tibetan Government in Exile, Tibetan Lamas, Tibetan monasteries in Tibet and India, and journalists 'all lies'. To NKT, only it knows the truth. NKT considers Shugden a reincarnation, an emanation of Manjushri as well as Tsongkhapa, a Dharma protector spirit and a Buddha compelling NKT's leadership in protests and attacks to protect Shugden whose worship comprises NKT's main practice. Shugden is not strong enough to protect 'himself'. As part of his fundamentalism, Gyatso organizes protests along side the communist Chinese government against the Dalai Lama around the world and on the Internet (the communist Chinese government is forcing Shugden worship in Tibet as part of its cultural genocide there). “And wouldn’t China promote it bigger and better than anyone. After all they have economic power base that is growing by the month. We have to look beyond this generation alone. We have to look at China and her relationship with Dorje Shugden long after the Dalai Lama has passed on…China is making Dorje Shugden bigger and bigger." NKT is determined that Shugden will be the most popularly known Buddhist Deity, whatever the costs. Judge for yourself how pro-communist-Chinese that NKT's PR division, the Western Shugden Society, can be - click here. However, extreme physical harm can come from pro-Shugdenite forces. For example, here and here. As noted above, "On 4 February 1997, the Director of the Institute of Buddhist Dialectics, a fearless and outspoken critic of Shugden practice, and two close students were found brutally murdered in the Director's room in Dharamsala." 6 April 2009, nine-year-old Tulku Tsenyi Khentrul Tenzin Tseten Rinpoche was enthroned as the reincarnation of late Geshe Lobsang Gyatso, the founder of the Institute of Buddhist Dialectics (IBD) and the College for Higher Tibetan Studies in Sarah, at a formal ceremony in Dharamshala. A battery of senior officials of the Central Tibetan Administration, including the supreme justice commissioner, Penpa Tsering, speaker of the Tibetan Parliament-in-exile and members of the Kashag attended the coronation ceremony at Tsuglagkhang, the main temple. The representatives from various monasteries and NGOs were also present at the occasion. He was recognised by His Holiness the Dalai Lama as the reincarnation of late Geshe Lobsang Gyatso on 1 February 2006.